Wilson brought in his only target for 16 yards and returned three kickoffs for 91 yards in the Buccaneers' 34-32 loss to the Falcons on Sunday. Wilson brought in two of three targets for 28 yards in the Buccaneers' 27-20 loss to the Cowboys on Sunday. He also returned two kickoffs for 69 yards. Wilson returned three kickoffs for 80 yards in the Buccaneers' 20-12 loss to the Ravens on Sunday. Analysis: Wilson handled kickoff returns for the second consecutive contest, turning in a respectable average of 26.7 yards per runback. 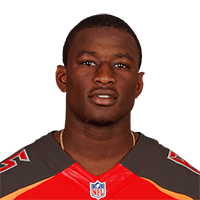 The FSU product could potentially see some action from scrimmage over the last two games of the season now that the Buccaneers are officially eliminated from playoff contention, but he's much more likely to remain in his current special teams role. Wilson brought in his only target for eight yards and returned two kickoffs for 44 yards in the Buccaneers' 28-14 loss to the Saints on Sunday. Analysis: Wilson logged his first offensive touch of the season and was also solid on his pair of kickoff runbacks. The FSU product already equaled his reception total from last season with Sunday's modest tally, but he may not achieve active status once DeSean Jackson (thumb) is able to return to action. Wilson was activated off the practice squad Friday, Greg Auman of The Athletic reports. Analysis: Wilson was waived by Tampa Bay in early September but has been on their practice squad since. This news comes in the wake of the news that DeSean Jackson's thumb injury will keep him out of Sunday's game against the Panthers. Wilson helps to provide some lost depth in Jackson's absence. 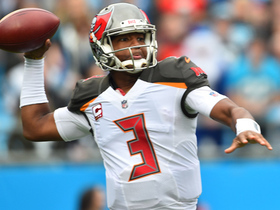 Winston connects former college teammate Wilson for TDTampa Bay Buccaneers quarterback Jameis Winston shows pocket presence, finds former college teammate wide receiver Bobo Wilson for touchdown.